This is the corner of my desk, sorry for the mass. 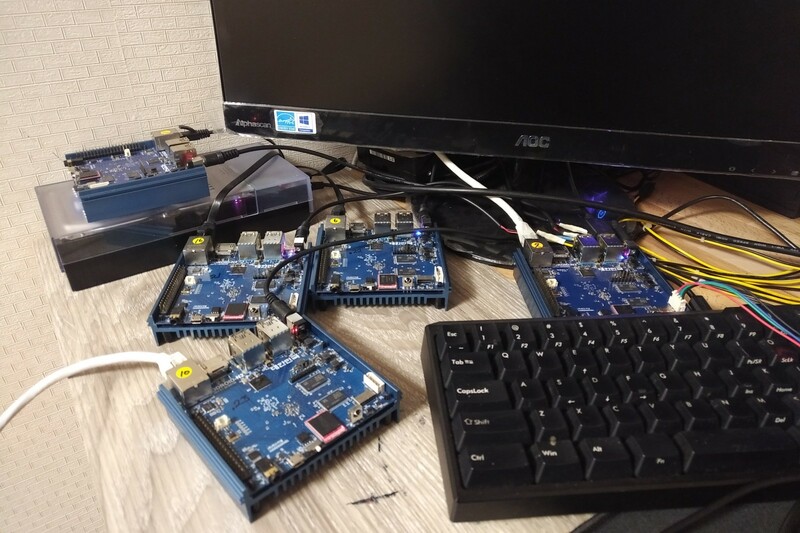 They keep building Linux kernel sources assigned by Jenkins and they are slaveries of my build firm that I recently finished to publish Debian packages for ODROID boards. I don’t have many packages to build and publish, but keep trying to run them for further uses what I am thinking. In order to let them work professionally, I felt I had to give a better environment and one idea in mind was giving a new place where they can be put together, but I had to pull back because I was busy for keyboard job. Eventually, ODROID-N2 is announced and it’s time to let people use ODROID-N2. I kept thinking about how they can put together and the best easiest way is to put one on top of another one. But the problem was ODROID-N2 cannot be stacked due to its heatsink body. 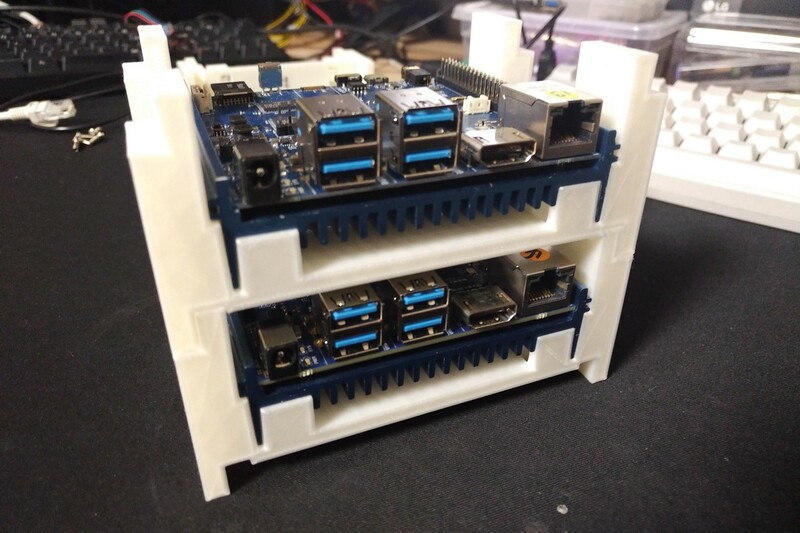 Even ODROID-HC1 and ODROID-HC2 were designed using the heatsink and they can be stacked since their original purpose was to build a storage farm while ODROID-N2 is not. The heatsink of ODROID-N2 was sorely aimed to radiate the heat from its CPU and it works very well. My solution to stack ODROID-N2 is adding a part to the heatsink body of ODROID-N2, such that they help ODROID-N2 can be stacked vertically and may be expandable to the side. I have spent a couple of hours to draw the idea of the part which can be attached to ODROID-N2 heatsink and expected to make them with the 3D printer, CR-10, I purchased last December. Right, the first version is failed. I added the mounting hole to the part such that the parts can be mounted together with M3 screws. 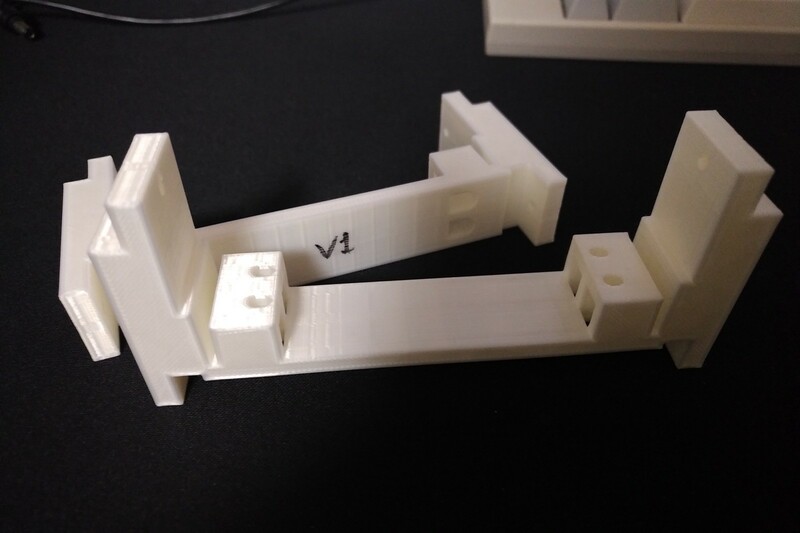 My fault was that the mounting part was designed like a jigsaw but the part which comes into another one was not able to be built with the 3D printer. 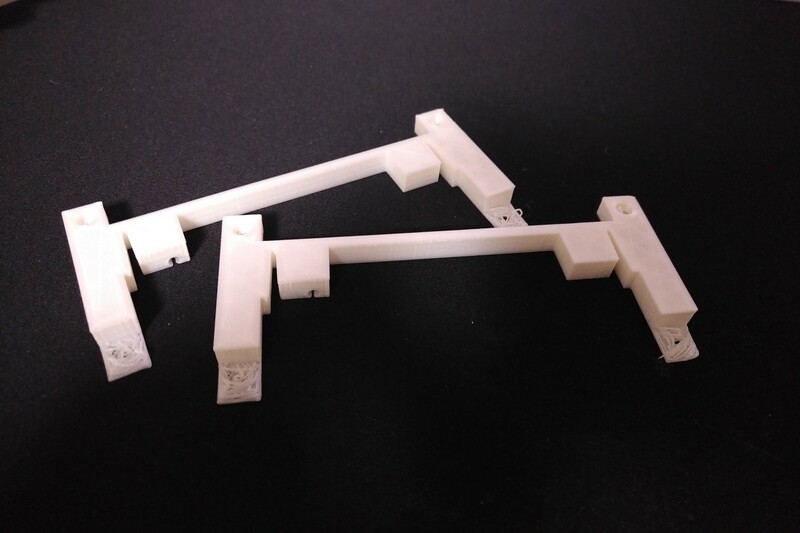 So I had to change the direction of the mounting holes that the body of the part does not have a place floated from the surface, otherwise next version would be also failed like the first one. After another hour, I have finished changing the direction of mounting holes and they looked very well. Also, I have added more mounting holes that hold the heatsink body with M3 screws. 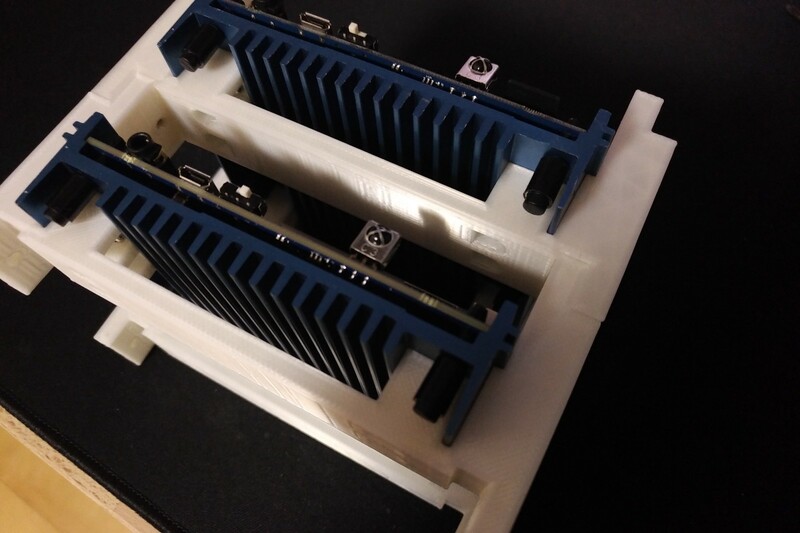 ODROID-N2 heatsink body has 4xM3 mounting holes at the bottom surface of it. It looks way better even though there are small mistakes of tight gap and hole positions but they were minor issues can be fixed. 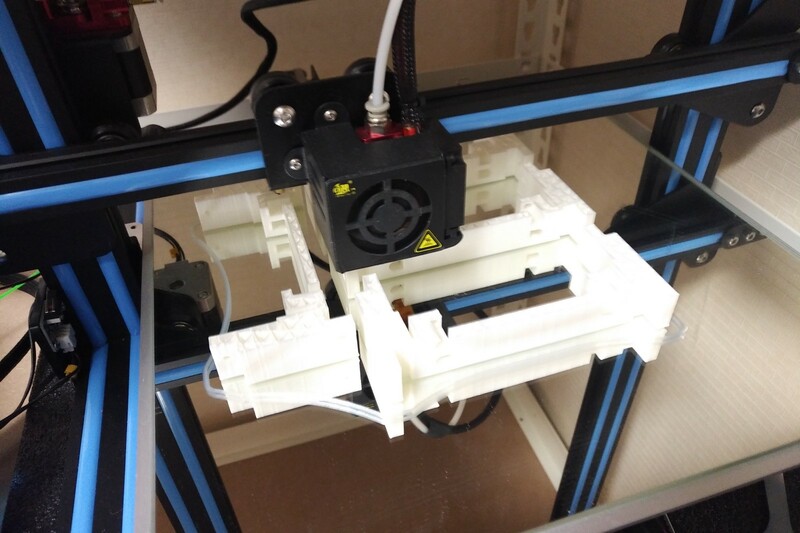 Two parts were printed to test with one ODROID-N2 and it took 3 and a half hours. 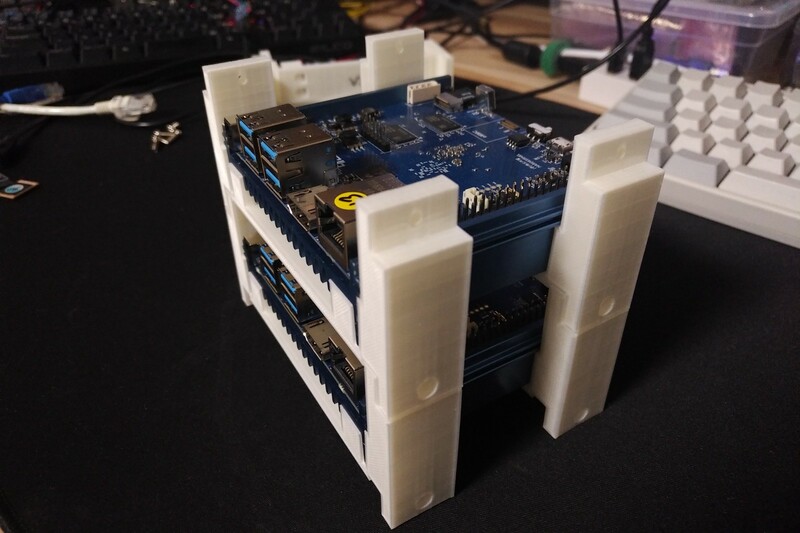 Meanwhile, another idea came to handle ODROID-N2 body and the first draft drawing was done while waiting for the second version of the stacking parts. Maybe next time, if I succeed the printing of it I would definitely share it. 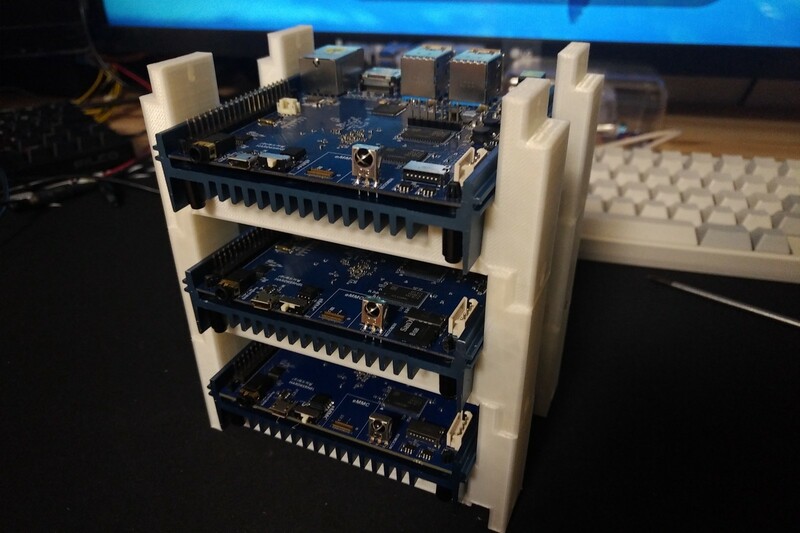 After fixing a couple of minor issues, I ran the 3D printer with the 3rd version and this time I put 4 parts to test with two ODROID-N2 how they can be stacked. Anyway, the 3rd version is much better they can be put together with each other as I expected. Some place of the part are a little bit tough to be put together needs some more gaps. Still, they can hold my ODROID-N2 boards and they also can be stacked on top of another one. Since I added screw holes to the mounting place of being coupled with each other, the whole stacked ODROID-N2 can be tightly mounted like a single body. Ok, so maybe later let me share the other models if I print out.